Last spring, the Board of Trustees endorsed Fulfilling the Promise, Brandeis University’s strategic plan. That milestone marked the culmination of a comprehensive process involving the entire Brandeis community, and it set the university’s strategic direction for the next decade. We can already see the difference the plan is making on campus and in the broader community in the university’s sharper focus on areas important to its success, from academic excellence and discovery and innovation, to organizational effectiveness, student life and alumni engagement. One of the strategic plan’s significant goals is building an engaged lifelong community: Brandeis will be a university to which prospective students are strongly drawn, current students are deeply attached, and alumni are enduringly committed. Alumni are instrumental in achieving this goal. You are critical to helping Brandeis attract students who make our campus vibrant and exciting. We are proud the Alumni Admissions Council has grown to 1,000 members on more than 25 councils around the world, and we are grateful for the work they do in helping recruit talented students. When you provide the benefit of your experience to students through organized events and career interest groups at the Hiatt Career Center, you give Brandeis students an essential professional advantage. Hiatt’s recent Perfect Pitch case competition with Cone Communications and other employers is a great example of how we are strengthening connections among Brandeis offices that serve students and alumni. You can view a video of the competition at http://bit.ly/1g6FoQw. Our new vice president of alumni relations, Patsy Fisher, who previously worked at Dartmouth, is helping the university take some dynamic steps. Since joining Nancy Winship’s team in Alumni and Development, Patsy has connected with many of you and plans to incorporate alumni feedback and other strategies into our programs. In addition, recognizing how critical alumni are to recruiting students and placing them in satisfying careers after graduation, we have created a new staff position in parent and alumni relations and volunteer programs at the Hiatt Career Center. Since I arrived at Brandeis, I have relished Reunion weekends. This year, we will welcome members of class years that end in a 4 or a 9. From the Class of 1954 to the Class of 2009, I hope to see you in Waltham in June. Regular attendees will tell you that Reunion is a great way to connect with your classmates, and feel the energy on campus firsthand. Powerful bonds connect the Brandeis family. Lifelong engagement cannot exist without them. How did Brandeis change your life? Did you help change the life of another Brandeisian? Perhaps your impact has altered the lives of many. I urge you to tell us your Brandeis story — it could help us strengthen our message to the world. Are you one of the many who met the love of your life at Brandeis? If so, your story could end up in the Summer issue of Brandeis Magazine, which is themed around love. 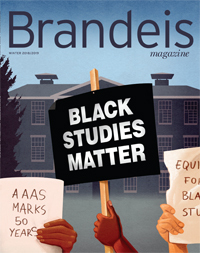 Please send us your stories at magazine@brandeis.edu. I look forward to meeting you on campus and off, exploring ways to deepen our partnership and collectively advance the university we cherish.